When Merck bought Sirna in 2006, the pharmaceutical giant took over Sirna's San Francisco Mission Bay research space at 1700 Owens St. and became the first major life science company to move into the up-and-coming biotech hub. Except, of course, for biomedical research megastar University of California, San Francisco, which opened the first building of its Mission Bay Campus in 2003 and currently houses its Biochemistry & Biophysics Departments in Genentech Hall, Byers Hall and Rock Hall. Also on the bayside campus are the William J Rutter Conference Center, Smith Cardiovascular Research Building, UCSF Housing, a child care center, the Helen Diller Family Cancer Research Building, the Orthpaedic Institute, and retail shops. UCSF's real estate holdings at Mission Bay total 57 acres, and the University currently employs over 2000 people at the MB campus alone (before the opening of the future medical center complex and the new Neurosciences Laboratory and Clinical Research Building). Merck announced recently that it will soon abandon its research facilities at the former Sirna space, which once totaled about 66,000 sf of the Owens Street building on several floors. Is that likely to impact negatively on the Mission Bay biotech hub's future as a whole? Very doubtful. Several other research related companies are still there, along with a Starbucks and a fitness center for the tenants. And since UCSF just lifted the first girder on its extensive hospital facilities at Mission Bay (due for completion in 2014), it's hard to imagine some other biotech firm (or several smaller ones, more likely) won't make use of this prime research space post-haste. Enormous, dedicated lab facilities can be difficult to repurpose simply because of their size and the infrastructure investment required to subdivide the space to function practically for smaller research operations. Occasionally, as with the former Pfizer complex purchased by the University of Michigan just this year (see our blog: University of Michigan Opens 174 Acre Research Campus Complex), the right player comes along with the resources to make it happen and winds up with a sweet deal. 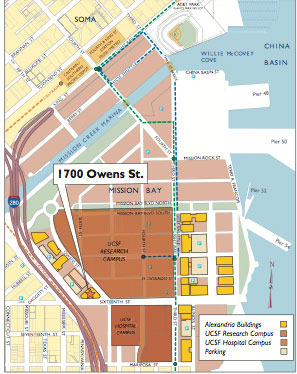 The 1700 Owens property in Mission Bay (shown at right) is already a multi-tenant space managed by the global life science labspace provider Alexandria Real Estate Equities. According to Labspace.com, "The ease of innovation enabled by the close proximity of key public sector entities such as UCSF, QB3, and the Gladstone Institute with varying leading-edge private companies is apparent when spending a day working in Mission Bay. The opportunity to participate in a highly collaborative environment conducive to sharing ideas, resources and talent across a vast range of scientific activities is a rare one, and is the hallmark of Mission Bay." So while the Merck exodus from San Francisco's bayfront may not be good news (that remains to be seen), it probably isn't bad news either, given the desirability of the property and its proximity to the UCSF Mission Bay Campus with its enormous building projects underway and its already powerful presence anchoring life science research in the biotech neighborhood. Would you like to meet with researchers in the Mission Bay area and experience the neighborhood? Biotechnology Calendar, Inc. will be hosting an event on the UCSF Mission Bay campus on January 26, 2011. This event is free to attend for Bay Area researchers. Biotechnology Calendar, Inc. is a full service event marketing and planning company producing on-campus life science research tradeshows nationwide for the past 18 years. We plan and promote each event to bring the best products and services to the best research campuses across the country. Visit our website for information about upcoming life science product shows in your area.